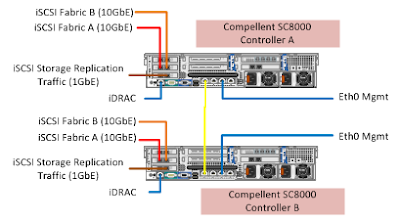 We have two sites and we have two Dell Compellent SC8000 Controllers per site. Each controller has - for front-end connectivity - 2 x 10 GbE dual port I/O cards, and 1 x 1 GbE dual port I/O cards. On each site we have a Dell M1000e blade chassis with 4 x M8024-k 10GbE blade switches, and 2 x M6348 blade switches. 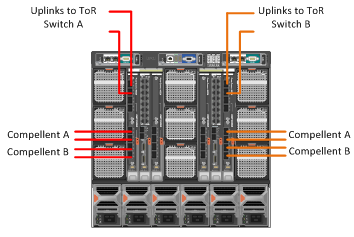 For performance reasons, we are going to keep most of the iSCSI and network traffic contained inside the chassis; there will uplinks to top of rack switches for iSCSI expansion to physical servers, uplinks to the core switches, and uplinks to edge switches for iSCSI replication across to the other site. Our blades will be Dell Poweredge M620’s, and they have dual 10 GbE NICs on the motherboard, Mezzanine 2 (Fabric B) is a quad port 1 GbE card, and Mezzanine 1 (Fabric C) is a dual port 10 GbE NIC card. 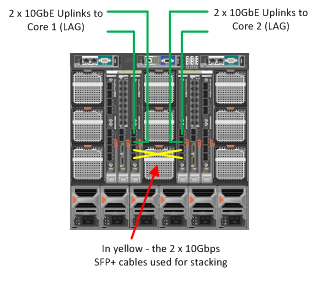 This design uses the blade chassis fabrics A1 and A2 for two independent iSCSI fabrics. Here we are using the SFP+ 10 GbE copper cabling. Because each Compellent controller has 4 x 10 GbE NICs for a total of 8, this necessitates purchasing the additional 4 port SFP+ expansion modules for each of the M8024-k’s used for iSCSI. All the internal ports would be access ports for either the default VLAN or a chosen iSCSI VLAN. 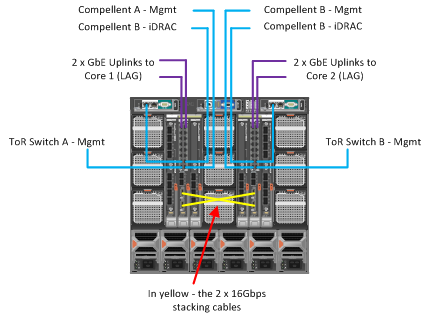 It could be argued that the addition of a quad port 1 GbE NIC to a blade server with 2 x dual port 10 GbE NICs is unnecessary, but in this scenario we have the M6348’s blade switches, and the quad port 1 GbE NICs, and one very useful thing that the M6348 does have is external 1 GbE connections that we can use for management links. All the internal ports would be trunk ports. Here we use the M8024-k’s for virtual machine network traffic (we could at a later date also add the ESXi host Management and vMotion VMkernels here if require more throughput than the 1 GbE NICs on Fabric B will give.) It is important here to have the correct connectors for uplinks to the core switch. All internal ports would be trunk ports. Finally, we need to integrate the Compellent controllers with the Edge switches for the iSCSI Replication traffic. The image below shows connections to either one edge switch or a stacked edge switch. The title is for a reason ‘A Design…’ and this alludes to the fact that there can be many different designs that will fit different implementation scenarios. The most important thing any design must do successfully is integrate with the existing infrastructure, and satisfy potential needs for future expansion. As always, comments are most welcome!